Up to the 1910s, cinema in Japan was still treated, both legally and artistically, no different from other misemono, or fairground, entertainment. However, by the mid-1910s, a group of intellectuals led by Kaeriyama Norimasa and known as the Juneigageki Undo (Pure Film Movement) was attempting to distinguish cinema "from fairground entertainments or theater, for being vulgar and lacking in the values inherent to the motion pictures" (Gerow, p. 14). The movement rallied against a national cinema which they thought as too theatrical, lacking in, by then standard, film techniques such as pannings, travellings, parallel editing or close-ups and still relying on oyama, male actors playing female roles. Thus, rather than arguing for cinema as an art form opposed to commercial moving pictures, the movement's main aim was to introduce into the Japanese film industry techniques of production from Hollywood and European cinema. Consequently, in 1917 Norimasa published a book which opened with the following statement "Theatre and cinema are completely different. People might think things shot during stage performances could be called cinema. However, true cinema has characteristics completely different from a stage performance, and we should distinguish cinema from theatre" (Okubo, p. 82). Likewise, light entertainment shows known as rensageki, a sometimes relatively complex combination of cinema and theatre, were particularly despised by the movement which judged them as a corrupt form of cinema, a noncinema. This, rather elitist, stance had the effect of allying the movement with state authority, which regarded the appeal of this hybrid form of entertainment to an emerging urban working class as socially undesirable and potentially dangerous. Film historians such as Tanaka Junichiro perpetuated the denigration of the genre describing it "as a 'cheap' form in a 'transitional period'", while Taro Akiba considered it to be "merely a fad" (Okubo, p.76). Recently, rensageki's social and historical relevance and its popularity among urban working class people, who constituted the largest percentage of rensageki's audience, have been rightly re-evaluated. According to Aaron Gerow, German art critic Konrad Lange "held considerable sway over Japanese film theory even up until World War II" (p. 96). Lange, as Bryan Ganaway quotes, believed that "art stood opposed to physical reality as embodied in technology" (p. 132). For this reason, film could not be an art because it was a technology of reproduction of this reality. Japanese film critic Nakagawa Shigeaki shared Lange's ideas that art should not copy reality and criticised "photography and film for creating an overly realistic illusion that was unmediated by the individual presence of the artist" (Gerow, p. 72). Although, he conceded that cinema could prove useful in science and recording history. In their writings before and after World War II, Japanese film theorists Imamura Taihei, Iijima Tadashi and Iwasaki Akira, however, "argued that film should be considered an art form that is as rich as literature, music, or drama..." (Cadzyn, p. 4). 100 years have almost passed since the Pure Film Movement's idiosyncratic efforts to elevate cinema to an art form, but, nonetheless, the Japanese government continues to disregard cinema's position alongside other art forms, such as painting, literature or theatre, as it seems to be following Nakagawa Shigeaki's theory of relegating cinema's cultural relevance to a mere device for recording history. Thus, on 10 July 2009, almost fifty years after its establishment, the Bunka Shinki-kai (Agency for Cultural Affairs), finally and for the first time, designated a film, MOMIJIGARI (1899), as Juyo-Bunkazai (Important Cultural Property). This cultural recognition was due, however, to MOMIJIGARI's value as a rekishi shiryo (historical document) rather than as a film. This visual recording of the two famous kabuki actors Ichikawa Danjuro IX and Onoe Kikugoro V performing dances from a popular play is considered to be the oldest surviving Japanese film, though neither of the two known prints in existence is the original one. This was destroyed by the Great Kanto Earthquake in 1923. In 1927, the Nikkatsu film company was able to reassemble from different sources an edited version of the original film which was then donated to the National Film Center in Tokyo in 2006. The decision taken by the ACA, though perhaps justified, is hardly original. In fact, as Ueda Manabu clearly demonstrates, since its delayed first release in 1903, newspapers already reported on MOMIJIGARI's importance as a cultural and historical visual document, and the film continued to be promoted in such a vein for several more years (p. 176). Ironically, Danjuro loathed cinema and forbade any public screenings of MOMIJIGARI while alive. He contended that kabuki could only be transmitted to future generations through actors performing live on the stage (Ueda, p.174). Four years after MOMIJIGARI was filmed, Danjuro, due to illness and contractual obligations, agreed to the first public screening of the film as a substitute to his cancelled live performance in Osaka. 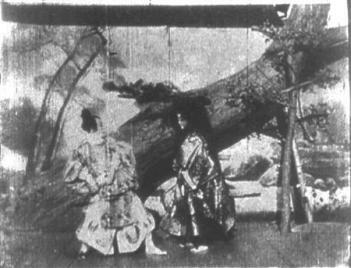 The death of Kikugoro in February 1903, and the forced retirement from the stage of an ailing Danjuro, served as the perfect advertising tool for early film promoters who highlighted the film's unique historical value. On 29 June 2010, SHIGEKI NANKO KETSUBETSU (A Historical play: Farewell of Nanko, 1921) became the second "film" to be denominated as Important Cultural Property. Just as MOMIJIGARI, SHIGEKI NANKO KETSUBETSU is a film recorded document, divided in two parts. The account of how these two parts were put together, resulting in the edited version now held at the National Film Center in Tokyo, is somewhat convoluted. The first part is a restored version of the short documentary SESSHONOMIYA DENKA KATSUDO SHASHIN TENRANKAI GOTAIRAN JIKKYO (The Prince Regent's Visit to the Motion Picture Exhibition, 206 feet and 5 frames or 3:26 minutes played at 16 f/s) which had been donated to the NFC by The Library Congress in the 1960s. This documentary shows Prince Hirohito, later to become Emperor Showa, visiting on 8 December 1921 the first government-sponsored exhibition on cinema in Japan. This was held at, what is now, the Tokyo National Museum, within the premises of the Yushima Seido (Yushima Sacred Hall), from 20 October to 10 December 1921. The exhibition was an effort on the part of the Ministry of Education, in collaboration with film companies, to improve the image of cinema which, until then, was considered to have had a harmful influence on the youth. The second part, (SHIGEKI NANKO KETSUBETSU, 1053 feet or 17:33 minutes played at 16 frames p/s), was owned by Nikkatsu until it donated it to the NFC in 2006. SHIGEKI NANKO KETSUBETSU briefly follows the prince to an open-air performance by Onoe Matsunosuke's troupe. 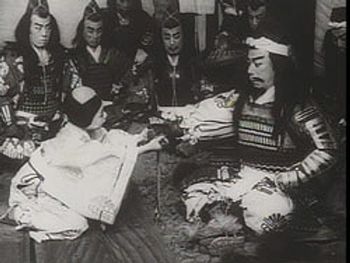 The larger part of the footage records the staging of the scene in which Lord Kusunoki Masashige, played by Onoe, bids farewell to his son Kusunoki Masatsura at Sakurai (1). It is highly probable that SHIGEKI NANKO KETSUBETSU's negative is the original one filmed on 8 December 1921. This makes it the second oldest negative among existing Japanese film material. Although kept by Nikkatsu, the film had in fact been shot by cameramen from the small film company Taisho Katsuei (1920-27). After its demise, Taisho Katsuei was absorbed by Nikkatsu and the print ended in the former's vaults partly because Onoe was in Nikkatsu's payroll as its top star. The film's historical relevance is unquestionable for it reflects the actual conditions of a film shooting during the early 1920s, as well as it provides a visual record of the greatest star of the Japanese silent period at work. Nevertheless, ulterior political motives weighing on the ACA's decision are easily discernible. The exhibition, the government's first sponsored film related event, represented the Minister of Education final endorsement of the new visual medium as an educative tool. Furthermore, the presence of the prince in this event had two functions. Firstly, and through the recorded documentary, familiarize his figure as the soon to become emperor of the country to the general public, and secondly, his apperance at the exhibition served to add it more legitimacy. An earlier attempt at promoting Prince Hirohito's profile had been the documentary KOTAISHIDENKA GOGAIYU JIKKYO, an extensive film coverage of his trip to Europe between March and September. On 27 June 2011, a third documentary film, KOBAYASHI TOMIJIRO SOGI (The Funeral of Tomijiro Kobayashi, 1910), was selected as Important Cultural Property. The film, shot by Yoshizawa Shoten, chronicles the funeral procession and service of Kobayashi Tomijiro (1852-1910), founder of the Lion Corporation (formerly Kobayashi Shoten), which took place on 16 December 1910. As with SHIGEKI NANKO KETSUBETSU, its most significant value does not reside in any artistic quality of the film itself but in its historical visualisation of the magnitude of a funeral attended by thousands of people and personalities such as Morishita Hiroshi, founder of Morishita Jintan. Added value is conferred to the film through what Benjamin called, in regards to early photography portraits of absent or dead beloved ones, "the cult of remembrance", but here, of a bygone and idealised era. The film follows the funeral procession from Lion's head office to the YMCA Hall in Kanda, Tokyo, designed by British architect Josiah Conder and completed in 1894, where the funeral service took place. 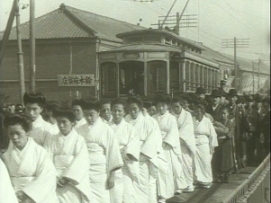 Thus, the ACA contends, the film provides a unique and vivid portrait of social customs, fashion and the hustle and bustle of Tokyo's trams navigating through streets crowded with passers-by at the end of the Meiji period. Furthermore, the film's negative that has survived to our days, donated by Lion Corporation to the NFC in 2003, was confirmed to be the original used during the shooting and, consequently, the oldest 35mm print known to exist in Japan (Tsuneishi, 63). The scarcity of prints from the early days of Japanese cinema makes KOBAYASHI TOMIJIRO SOGI a significant discovery (2). Though, having said this, in an age of mechanical and digital reproducibility where, as Benjamin argued, asking for the "authentic" print to justify its value makes no sense, the ACA has precisely placed a considerable value on this work for being the original, not a copy, negative used during the filming of the documentary. There is no reason not believe that older prints will emerge in the foreseeable future. Were this to happen, how could the ACA justify the value given to KOBAYASHI TOMIJIRO SOGI's originality? Laudable though the decision reached by the ACA to finally award cinema as an important cultural property might be, its three choices seem, nonetheless, rather unfortunate as they do little justice to the outstanding output of Japanese cinema. Although, in its 2013 policy report, the Agency for Cultural Affairs states that they "think of music, fine arts, literature, theater and film as art or artistic culture", the reality is that they have devalued films to mere Historical Resources (Rekishi Shiryo) within the section of Fine Arts and Crafts (Bijutsukogei) for Tangible Cultural Property (Yukei Bunkazai). Perhaps accusing its foreign origins, cinema has been excluded from heading its own category as Tangible and Intangible Cultural Property, as is the case with other art forms (painting/kaiga, sculpture/chokoku, calligraphy works/shoseki, classical books/tenseki, drama/engeki or music/ongaku), which could be viewed as more distinctively Japanese. Therefore, the question remains as to how much longer government authorities will take before overdue credit is given to, for example, works like TOKYO MONOGATARI (Tokyo Story, Ozu Yasujiro, 1956), which has consistently been included among the best 10 films in world cinema history by several film publications. Thus, in 2012, for example, Sight and Sound placed three Japanese productions in the best top twenty films, TOKYO MONOGATARI being selected as number 3. Perhaps, it should be about time for the Agency for Cultural Affairs to start applying different parameters for measuring the historical and cultural worthiness of a film production, and add "new ones" such as the intrinsic artistic value of a film, which has yet to be taken into account by the Agency. Benjamin, Walter The Work of Art in the Age of Mechanical Reproduction (1936). From Walter Benjamin, Illuminations, 1968, edited by Hannah Arendt. Bunka Isan Online (Cultural Heritage Online), Eiga Firumu [KOBAYASHI TOMIJIRO SOGI]. Bunka Isan Online (Cultural Heritage Online), Eiga Firumu [MOMIJIGARI]. Bunka Isan Online (Cultural Heritage Online), Eiga Firumu [NANKO KETSUBETSU]. Cadzyn, Eric The Flash of Capital: Film and Geopolitics in Japan, Duke University Press, 2002. Ganaway, Bryan Toys, Consumption, and Middle-class Childhood in Imperial Germany, 1871-1918, p. 132, quoted from the original Konrad Lange, Kunst und Spiel in ihrer erzieherischen Bedeutung, Dind und Kunst, I: I (October 1904). Gerow, Aaron Visions of Japanese Modernity Articulations of Cinema, Nation, and Spectatorship, 1895-1925, University of California Press, 2010. Itakura Fumiaki [Shigeki Nanko Ketsubetsu] (1921 nen) Kanensei Nega Firumu o Dotei Suru / Identifying the Nitrate Negative Film of Shigeki Nanko Ketsubetsu (1921), Tokyo Kokuritsu Kindai Bijutsukan Kenkyu Kiyo / Bulletin of the National Museum of Modern Art, Tokyo (14), 2010, 45-55. Miyao, Daisuke The Aesthetics of Shadow: Lighting and Japanese Cinema, Duke University Press Books, 2013, pp. 50-51. Nornes, Abé Mark Japanese Documentary Film: The Meiji Era Through Hiroshima, University of Minnesota Press, 2003. Okubo, Ryo Kinodrama and Kineorama: Modernity and the Montage of Stage and Screen in Early Twentieth-Century Japan, Iconics, Volume 10, 2010, pp. 74-95. Saiki, Tomonori, SHIGEKI NANKO KETSUBETSU in La luce dell´Oriente: cinema giapponese muto, 1898-1935 / Light from the East: Japanese Silent Cinema, 1898-1935, 20th Pordenone Silent Film Festival, Sacile, 13-20 October 2001. Tsuneishi, Fumiko KOBAYASHI TOMIJIRO SOGI in Light from the East: Celebrating Japanese Cinema Shochiku 110 - Naruse 100 -- Prog. 4, 24th Pordenone Silent Film Festival, Sacile, 8-15 October 2005. Tsuneishi, Fumiko From a Wooden Box to Digital Film Restoration, Journal of Film Preservation, Vol. 85, October 2011, pp. 63-72. Ueda, Manabu Kankyaku-sei no Henyo - Momijigari o Megutte in Nihon Eiga Sosoki no Kogyo to Kankyaku: Tokyo to Kyoto o Chushin ni, Waseda Daigaku Shuppanbu, 2012.